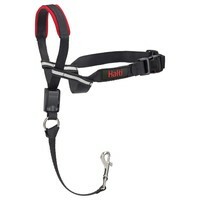 Halti OptiFit Headcollar is a premium headcollar that has been designed to provide an optimum fit and which guarantees to stop your dog pulling. The OptiFit Headcollars unique design works by gently directing the dog’s head, steering him into desired positions. A self-adjusting chin strap and unique, reflective cheek straps follow the contours of your dog’s face to ensure the OptiFit doesn’t rise into their eyes or slide down to their lips.